Pride Poetry Palooza usually comes but once a year but everyone had so much fun in July we decided to do it all over again! 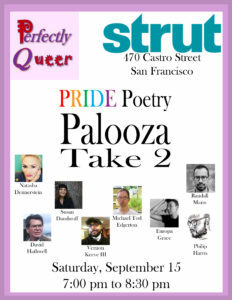 Take 2 is Saturday, September 15, 7pm to 8:30pm at Strut, 470 Castro St. in San Francisco. 8 poets will read 8 minutes each: Susan Dambroff, Natasha Dennerstein, Europa Grace, Michael Tod Edgerton, Philip Harris, David Hathwell, Vernon Keeve III, and Randall Mann. Free admission. Better yet, free fruit pies and cold glasses of milk will be served. (Nothing goes better with Queer poetry than fruit pie.) Eight–count em, 8–door prizes awarded at 7pm to reward promptness. Book signing and wine follow the readings. Come on out for Pride Poetry Palooza–and pie!